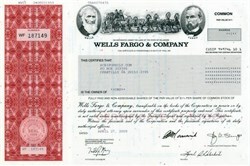 Beautifully engraved certificate from the Wells Fargo and Company dated 2009. This historic document was printed by the American Banknote Company and has a vignette of the portraits of Henry Wells and William Fargo, with a stagecoach in the center. This item has the printed signatures of the Company's Chairman and Secretary. Wells Fargo & Company is a diversified financial services company with $370 billion in assets, providing banking, insurance, wealth management and estate planning, investments, mortgage and consumer finance from more than 5,800 stores across North America and elsewhere internationally.